Multiplication is accomplished by “skip counting” or, as we say, counting by two or three, etc. 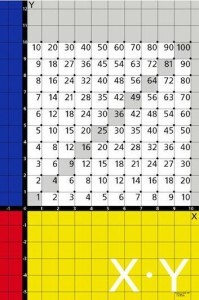 In this hundreds chart, which is ordered like the Cartesian coordinate system, left to right, BOTTOM to TOP, you can observe the patterns produced by “skip counting” for the numbers 1 through 10. Click the X•Y Chart below to look at these patterns. Please share with your children. ← The X•Y Chart for the Home.